Some Disney goodness to add to my ever growing Disney collection ~ I’m really feeling the Disney love this year as off to Walt Disney World later in the year- whoop! I received my package from @Gingerbread today! Thanks so much, Gingerbread! Everything is wonderful! Baking goodies, unicorn goodies, and chocolate goodies! And finally, two lovelies that have been on my wish list for a loooong time, Sweet Pop (SO BEAUTIFUL!!!) and lavender Ember (adorable!)! I spilled water on my laptop in it’s not working right, but I wanted to let you all know I received my box from kittensquid. I loved everything and the candy is gone. I have been eyeballing Caramel Crunch forever and I was so happy to find her in my box! I’ll load pics if I can get my computer working right. Yay! Awesome Easter swappy goodness everypony! Such fabulous ponies, they all look great so far! Hope your laptop dries out with no issues @Cactusflower and I can't see @skig pics either, must be something up with that? So far boxes are looking great though, what is the kitty thing in the left of the picture? I can't quite tell? It might be the way I uploaded through the "drag & drop." Will see if I can fix it. EDIT: I think I fixed it. I downloaded them from my Google account and uploaded them to the thread. I can see them now! My box arrived today!!! Thank you SOOOOOOOOOOO much @skig I love everything!!! The beautiful card hand drawn of Thimble Bright Sew Bottom! Love it! Look at all the fun packages to open!! Everything revealed! Fun stuff for me, and treats for the kitties and birdies! 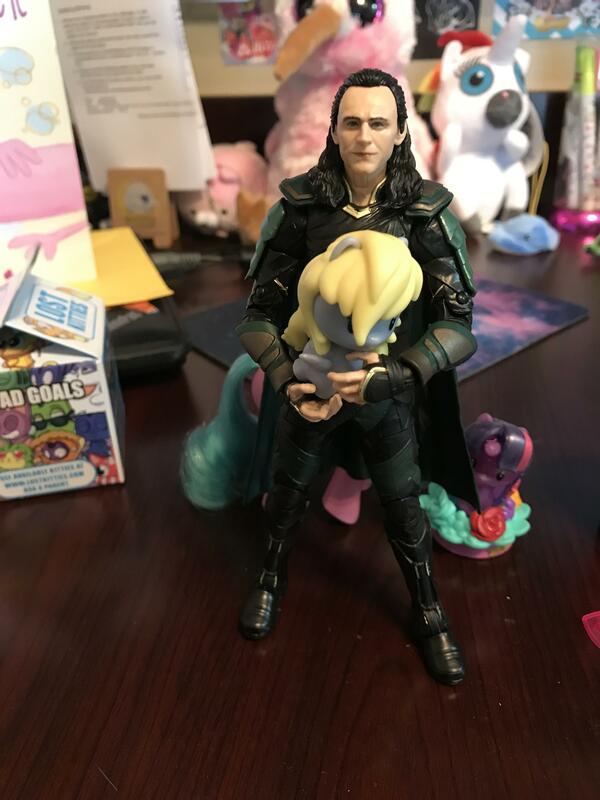 I need to find a special place for the cute little purple plush bunny. And the BEST PART!!! BABY BOWTIE!!! She is absolutely perfect! Blue and pink and cute and her symbols are even still pink! 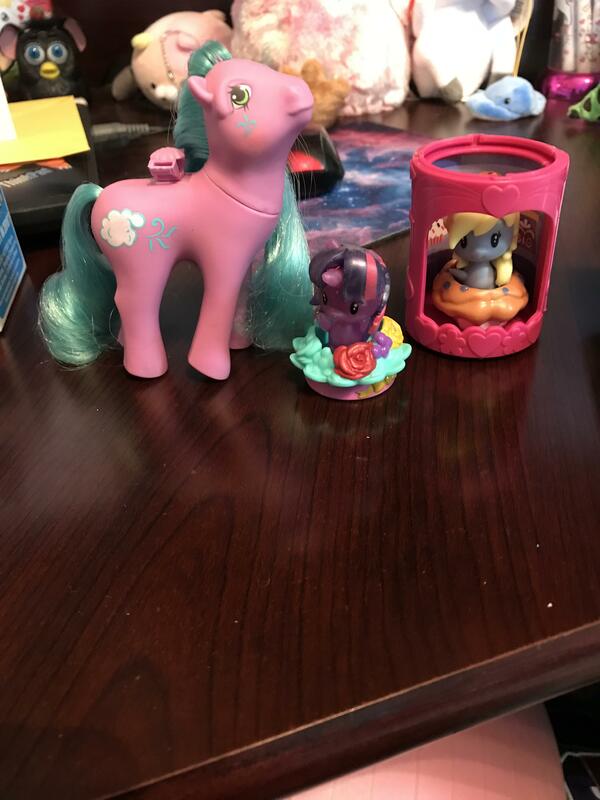 I can't wait to get my collection out of the garage so I can display her next to Baby Applejack! I am so happy I decided to join the swap! 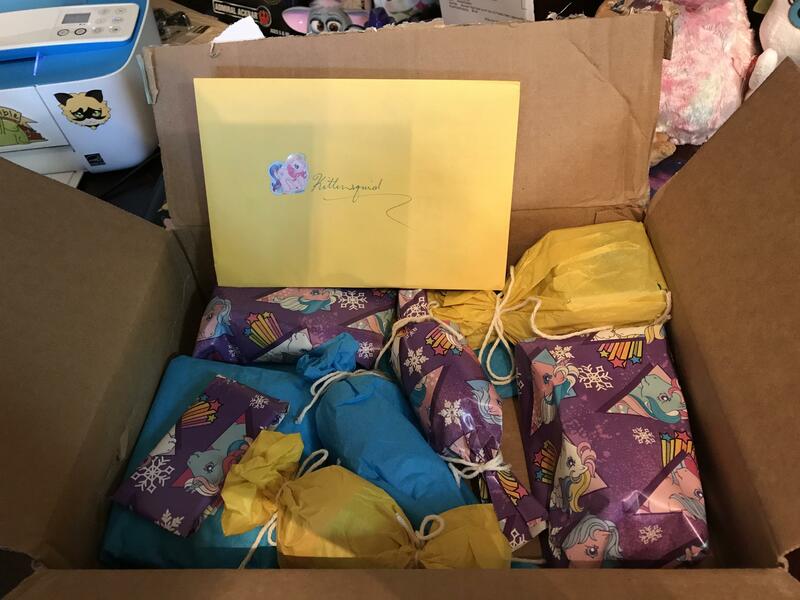 So much fun to shop for my partner, and this package BEYOND made my day! Thank you!!! @Cactusflower i'm so glad you liked everything!! I'm glad the curly haired duo made it to you safely. Sorry to hear about your computer, hopefully it dries up all right! I'm so glad that you like everything, @CJFullmer ! I had fun shopping, and the kids had fun trying to help me wrap and pack and asking a million questions about where the presents and "my beautiful unicorn" were going. Yes, Sarris Candies is a Southwestern PA staple. They're based in Canonsburg, and I believe they ship. Their meltaways are delicious! I got the loveliest Easter package from @CJFullmer yesterday! It really brightened my day when I needed it the most. Look at all that pretty wrapping! And THIS bounty awaited me inside, look at all those awesome blind bags, I was in heaven! This was the final pony tally, you'll notice there's a Derpy Hooves!!! I can't tell you how happy this made me, my life has been so full of crap the past few days (husband broke my sewing machine, cat pooped on the carpeting, and there's a leak in our heating duct turning our bedroom into a swamp), getting Derpy was truly sunshine on a cloudy day for me! Thank you so much, CJ, you really made my whole day. 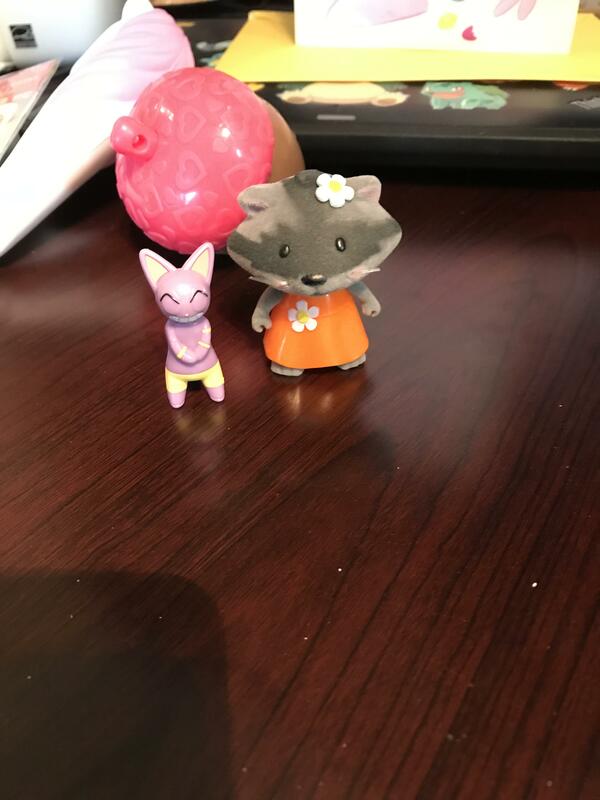 These two cuties were in the other blind bags, allow me to introduce Pants the cat and Riley the raccoon! I'm so glad you're happy with the swap box @kittensquid !! I had a lot of fun shopping for you and it took a lot of restraint to not open those cute little blindbags... I wanted to know what was inside!!! All the pretty, wrapped goodies, card and candy, mmmmm.....yum! 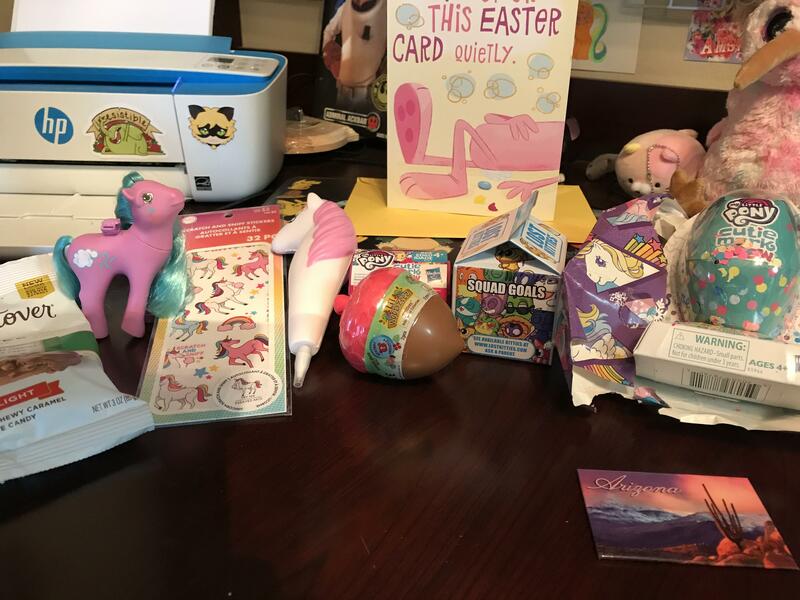 The cute Easter egg animals were all full of the candies and a First Tooth baby toothbrush and Easter erasers! That puffy unicorn pen has the sweetest face! She's such a pure and beautiful creature! The awesome magnet you sent is on my fridge with the rest of my magnet collection lol.